The move enables the combined NXP-Qualcomm company to make a big leap forward in areas like ADAS and automotive connectivity. NXP, which only relatively recently had concluded the takeover of its rival Freescale, has now itself been swallowed by a much larger competitor—Qualcomm. The strongest effect of the takeover will be seen in the automotive chip market. The Freescale takeover already catapulted NXP to the pole position in this particular market segment where Qualcomm so far was never a leading player, at least it was not among the ten largest chip providers for the car industry. Nevertheless, Qualcomm built up significant expertise in seminal areas like wireless charging (for cars as well as for smartphones), computer vision, machine learning and sensor fusion. The move enables the combined company to make a big leap forward in areas like Advanced Driver Assistance Systems, automotive connectivity and eventually autonomous driving. In this market, the combined company will have the appearance of the new 500-pound gorilla. It is difficult to tell which competitor will be hit hardest by the takeover, but one certainly is not wrong to believe that in particular STMicroelectronics and Texas Instruments, in the automotive market currently ranking number four and five, should have reason for concern. In particular TI’s product portfolio in the areas of automotive electronics and IoT is positioned to compete head-on with the newborn heavyweight. Renesas and Infineon, currently number two and three in the automotive segment, will also have to dress warmly, albeit at a lesser extent. Renesas, in particular, has its product portfolio in the automotive segment focusing more on the head unit and infotainment segments where its position probably is strong enough to withstand the intensified competition. Infineon has another unbeatable advantage—it is very strong in the market segment of power electronics. Qualcomm and NXP both have not more than a blind spot at this region of the semiconductor market. 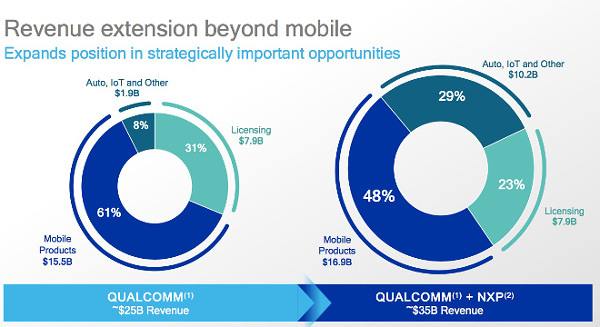 How strongly the move will change Qualcomm’s profile can be seen by its revenue distribution. Currently, Qualcomm achieves only 8% of its sales in the automotive sector, rendering the company a remote contender in this competitive market. After the takeover, this share of the company’s revenue will rise to 29% and be the second largest segment (after Mobile Products with 48%). Many thought leaders and analysts call the connected car “the largest smartphone available.” Given this view is correct—and there is little reason that this is not the case—the combination of Qualcomm and NXP is absolutely right under strategic aspects. The move will certainly will leave deep traces in the semiconductor industry.